The online version of this article ( https://doi.org/10.1186/s40168-019-0652-3) contains supplementary material, which is available to authorized users. The hadal zone (6000–11,000 m) is the deepest part of the marine environment and is composed almost exclusively of trenches. Hadal zone planktonic microbial communities have recently been investigated in the Mariana [1, 2, 3], Puerto Rico , Japan , and Kermadec Trenches  due to rapid technological progress in deep-sea sampling. The hadal and abyssal (4000–6000 m) waters differ significantly in their micro- and macro-community compositions [1, 5, 7]. 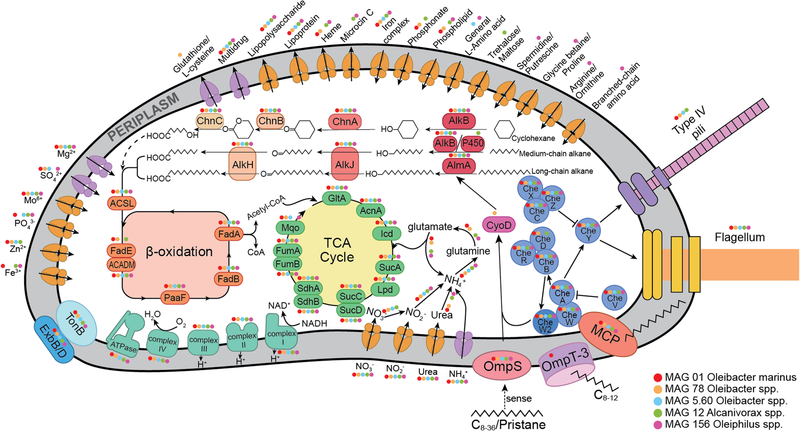 Specifically, heterotrophic Gammaproteobacteria and Bacteroidetes are dominant in the hadal ocean, compared to Thaumarchaeota in the abyssal ocean [1, 5, 6]. There are only a few depth profile studies of microbial communities in the hadal zone, and thus, little is known of the variability in community composition in this unique environment. In the Challenger Deep of the Mariana Trench, Nunoura et al. 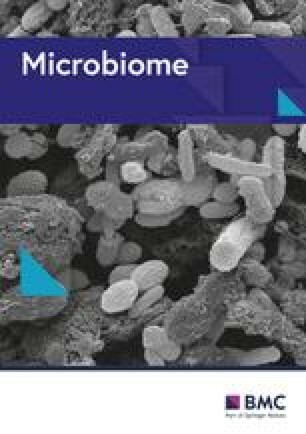 demonstrated via 16S rRNA gene sequencing that Gammaproteobacteria were the dominant class at ~ 10,257 m, comprising 62.7% of the total microbial population, compared to 21.6% and 1.7% at 9000 and 7998 m, respectively . Moreover, Oceanospirillales comprised 78.1% of the total Gammaproteobacteria population at 10,257 m, unlike at 9000 m where Pseudomonadales dominated. Tarn et al. also confirmed the dominance of Gammaproteobacteria in both the Challenger (~ 10,918 m) and Sirena (~ 10,667 m) Deeps of the Mariana Trench, using 16S rRNA gene sequencing . The drivers for this major microbial community shift at depths > 10,000 m are undetermined, since studies analyzing the genetic potential of microbes  and their abundance at the genus and species level at these depths are limited. To the best of our knowledge, the proportion of Oceanospirillales-derived alkane degraders in NBW (~ 20% in the metagenome and ~ 38% in the 16S rRNA gene amplicon; Additional file 1: Figure S4a and c) is higher than in any other natural environments observed on Earth. 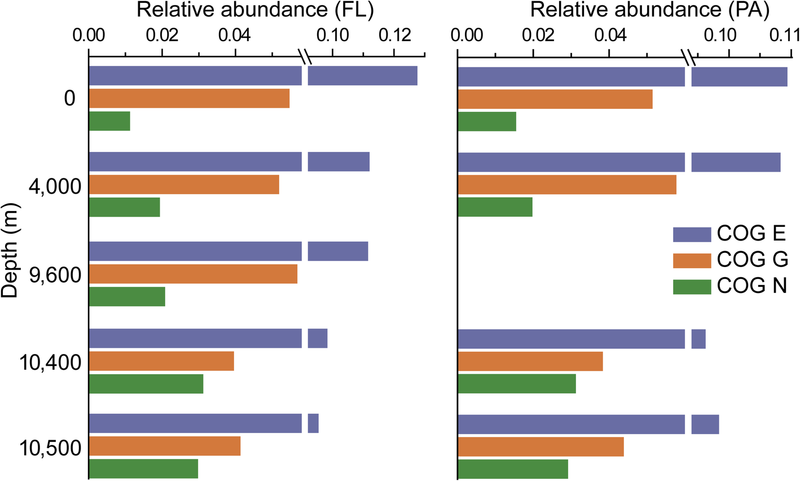 However, the predominance of Oceanospirillales, along with MCP, alkB, and type IV pilus assembly genes in NBW, resembles the situation (dominant microbial communities and functional genes) in the Deepwater Horizon spill (DWH) [15, 16, 17, 18, 19], suggesting that the microorganisms in these two distinct environments most likely share similar hydrocarbon-degrading pathways. However, the predominant DWH Oceanospirillales showed high sequence similarity to Candidatus Bermanella macondoprimitus and/or Candidatus Oceanospirillales desum [20, 21]. Although O. marinus was detected in n-hexadecane enrichments using water collected from oil plume at 1000 m after the DWH, it only represented 3% of the total sequences . To determine the sources of n-alkanes in hadal surface sediments at depths of 10,908, 10,909, and 10,911 m (Fig. 6b and Additional file 1: Table S7), we investigated their distribution and concentrations (total n-alkane concentration averaged 2.3 μg/gdw). Interestingly, higher concentrations of n-C18 and n-C20 (and n-C16 in one sample) compared to n-C17/19/21 alkanes (Fig. 6b) were observed. The predominance of even-chain alkanes has been reported previously by other studies, e.g., in sediments from the Black and Mediterranean Seas, Arabian Gulf, and Cariaco Trench , and from the Mariana Trench sediments at depths of 4900–7068 m . These were markedly different from those profiles seen in the sinking particle samples, suggesting that even-chain alkanes in hadal surface sediments have a very different source and are likely synthesized in situ and/or released from subsurface sediments. To provide further evidence for the origin of these compounds, we investigated the carbon and hydrogen isotope compositions of n-C16 and n-C18 alkanes (Fig. 7). The δ13C values of n-C16 and n-C18 alkanes ranged from − 30.2 to − 28.7‰, similar to those reported by Guan et al. , which are not very source specific as these values fall within the range of isotopic compositions of hydrocarbons derived both from petroleum as well as from autotrophic and heterotrophic organisms . However, more crucially, the δ2H values of n-C16 and n-C18 alkanes are much more informative. 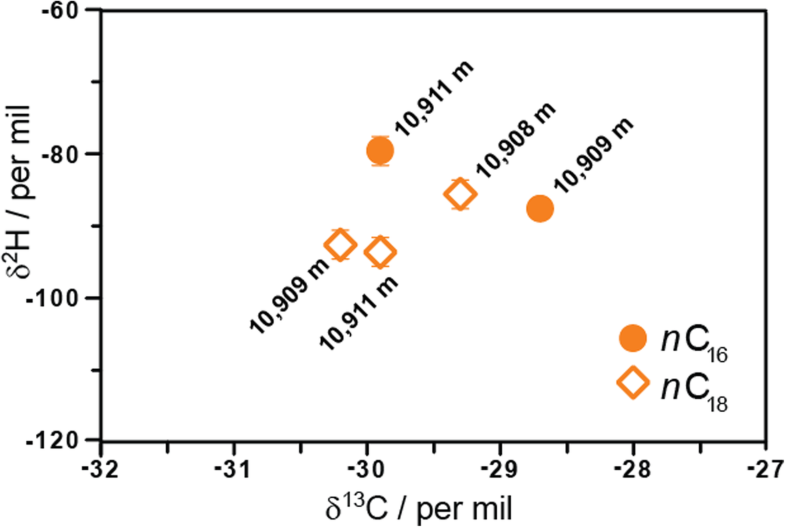 They varied from − 79 to − 93‰, which are higher than those typically assigned to petroleum sources (− 90 to − 150‰ ) and fall within the range of lipid/water 2H/1H fractionations reported for heterotrophic organisms (− 150‰ and higher ) assuming the δ2H of water is ca. 0‰. 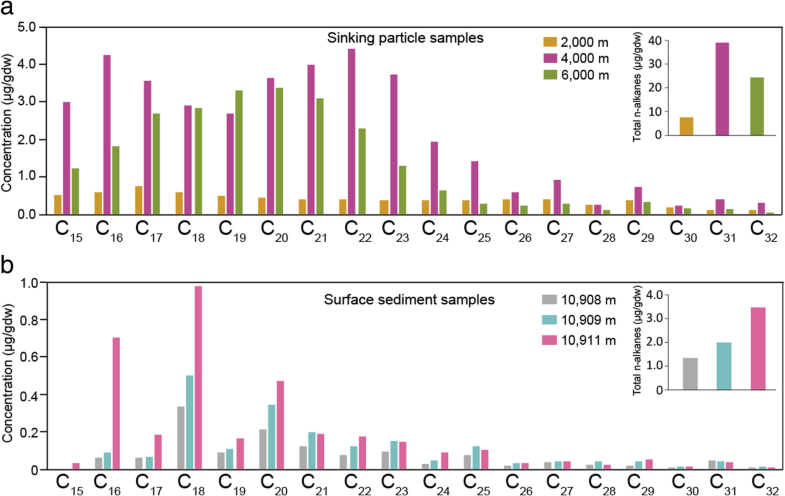 These δ2H data suggest that n-alkanes in the hadal sediments most likely derive from a distinct biological source (e.g., from heterotrophic communities ) that results in a smaller hydrogen isotope fractionation. This source differs from that produced by known hydrocarbon-producing marine organisms, predominantly photoautotrophs, which synthesize only odd-C-numbered hydrocarbons [34, 35, 36], suggesting that the microbial producers might utilize a different, and still poorly understood biosynthetic pathway.